A professional and smart network diagram software for Linux helps you visualize where your infrastructure is lacking and what needs to be upgraded/replaced. Edraw network diagram software for Linux is a versatile diagramming tool which is affordable in price but powerful in functions. It has a similar interface with Microsoft which helps people get used to it quickly. 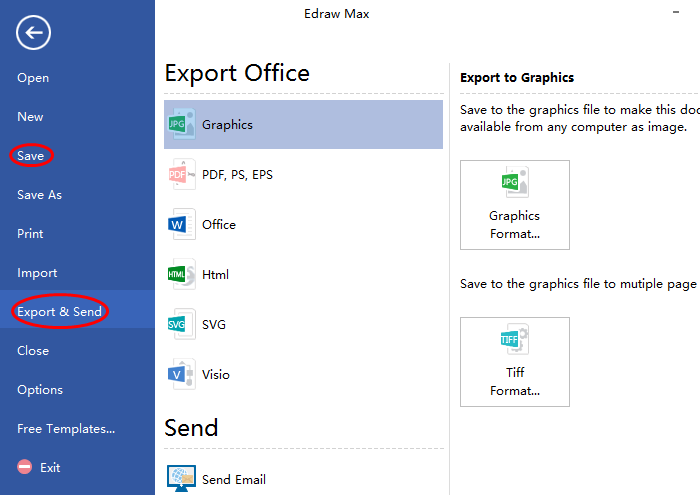 Drawing, editing and sharing diagrams are pretty easy with Edraw. Welcome to download and enjoy its ease of use! Following are key features of our Linux network diagrams which are preferred by most users. 1. 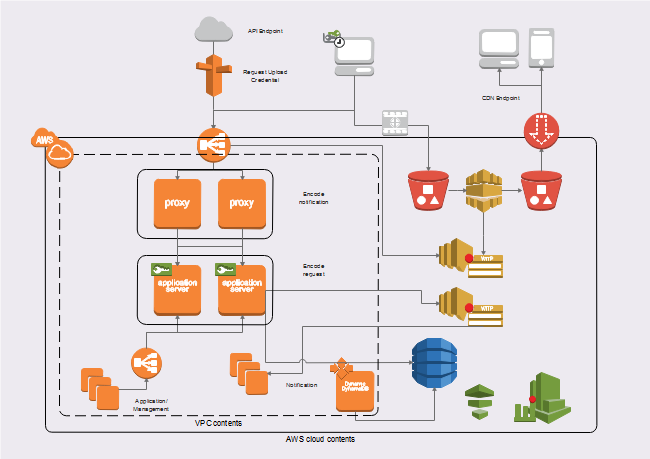 It is a full suite tool with the capability of creating 3D network diagrams, AWS diagrams, logical network diagrams, rack diagrams, cisco networks, LDAP, etc. 2. Lifetime upgrades guarantee with reasonable price makes every penny well spent. 3. 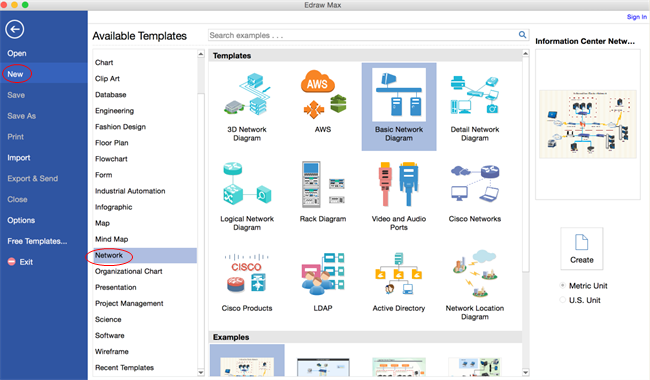 It provides a large amount of network diagram shapes and templates to help users get started quickly and easily. 4. Users are permitted to free design their own shapes with prepared a set of drawing tools if they can not find the one they want in built-in shapes. 5. Inserting attachments, hyperlinks and notes is supported which makes diagrams tidy and rich in contents. 6. It is quite convenient to share diagrams with others by exporting diagrams to commonly used file formats with just one click. 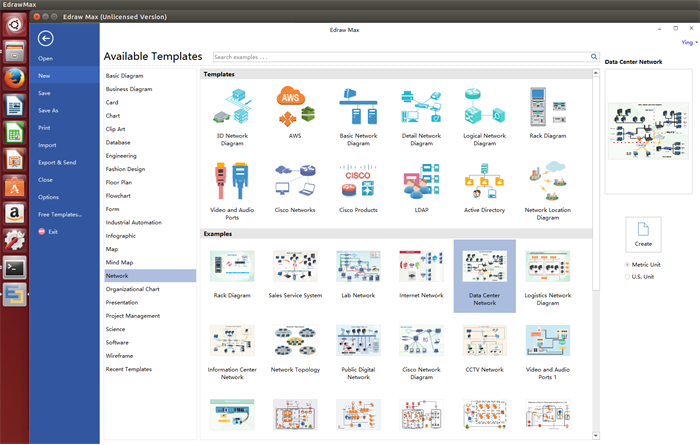 There are a large quantity of network diagram shapes provided by our network diagram software for Linux and all of them are grouped into different categories for ready reference. Users are allowed to drag, drop and edit these shapes for free or design special shapes that suit them best with embedded drawing tools. Let’s take basic diagram as an example and this guide will show you a simple guide on creating basic network diagram on Linux effortlessly. Step 1. 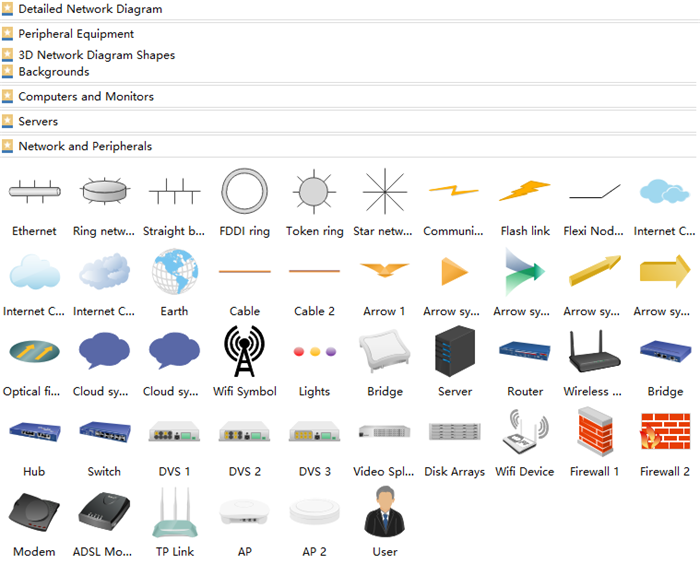 Start Edraw, go to File menu > New > Network and open a new drawing page by clicking the icon of Basic Network Diagram under Templates page. Step 2. Navigate to left libraries, drag proper network diagram shapes from different shape categories and drop on the drawing page. Just feel free to edit the sizes and directions if necessary. Step 3. Put your cursor on the Ethernet shape and a comes out which works as a built-in connector. Drag it to a connection point on the device shapes when the turns into a four-headed arrow. When the connector turns red, it means shapes are glued. Step 4. Add texts by double clicking the shapes or click Text under Home page to open a text block and add texts. Step 5. Go back to File menu again and click Save on File tab to save the diagram as default format .eddx, or hit Export & Send to export it to commonly-used formats for sharing conveniently. 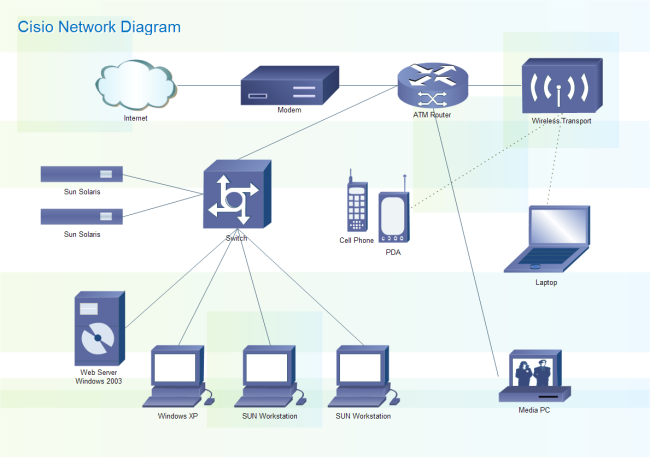 Here list several tips that may help you with creating effective network diagrams. Sketch out the core components of your network with a paper and pencil first. Highlight important information with different typeface and differentiate different divisions with colored backgrounds. Think outside of the box on how to avoid crossing links. Use grids and guides to maintain symmetry and keep everything evenly spaced. Frame your diagram and provide basic information with a border makes your digrams more professional. 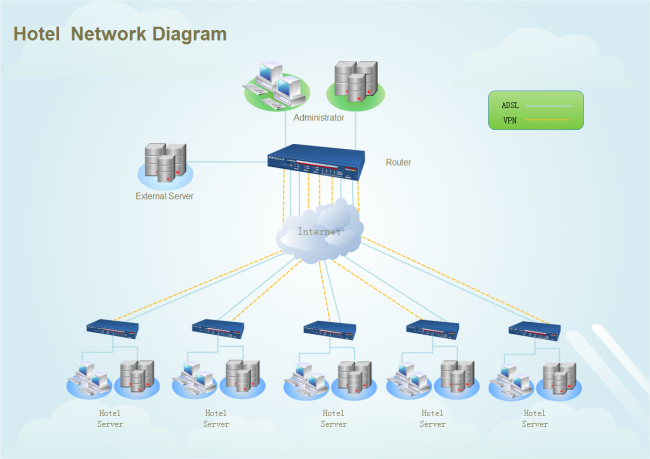 Below are network diagram examples created by our network diagram software for Linux. All the examples it created can be downloaded, edited, shared and printed for free. So please feel free to download the one you like if any interest.